After the announcement of the EuroBasket Women 2009 training roster, Pierre Vincent explained during the telephone conference “that our preparation will be difficult because it will start on a Monday (4 May) with 80% of the players missing because of the various competitions”. He went on to state that it he would only have all the players on his list by Monday, 18 May after all competitions would have been completed. His major concern is that the players will be tired and maybe carrying knocks from their competitions, which is not really ideal. He expects it will be very difficult to be ready with only 15 days with everybody together. All the same he will reduce his squad to 15 players after the first training camp in Lyon which concludes with a 3-match series against Greece. He will only make his final selection of 12 players before they depart for Latvia. Cathy Melain who was available for questions explained that at first when Vincent spoke to her about coming back to the team, her first reaction was to refuse. On second thought however she decided to accept because of her attachment to the French national team. Her role outside the court is to help the players from the various generations to better mix and become one unit. Caroline Aubert (right) is already training under the supervision of the fitness and training co-ordinator of the French national team. Emilie Gomis who was injured at the end of last season while playing for USVO is back in the roster after a season playing abroad. 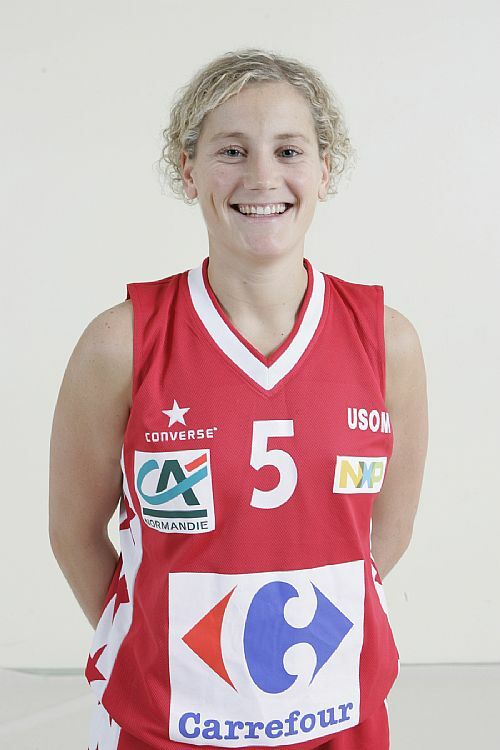 Elodie Godin who has had a good season in Italy is another welcome to the squad. The main question people asked is why Géraldine Robert was not in the training roster. Vincent responded that basically France had some very strong players in her position and despite her ability inside the paint, Robert was not as strong - as the inside players he had chosen - from the outside. So this time around her profile was not what he required. However he made it clear that he has not ruled out calling her up in the future. Furthermore it was the decision of Edwige Lawson-Wade not to be included in the training roster. Her husband lives in America and they have been apart for most of the European season. She has agreed to stay on stand-by in case of emergency.